A South West recycling company is launch a revolutionary device to process metal cans on the move at a national trade show next month. The new product, called KerbCan, is designed to save time and money for councils and recycling businesses by sorting and crushing the cans as they are being collected. Currently collection vehicles have to return to their depot part-way during their collections as they become full. Crushing the cans en route means they take less space, and the blocks, or bales, of crushed cans can be sold on straight away, with no need for further processing. The simple, yet pioneering, concept has been developed by Advanced Recycling Solutions (ARS), based at Tolvaddon near Camborne. It will be launched at the national Recycling Waste Materials trade show in Birmingham’s NEC next month. The company has been making a range of devices to recycle metal, paper, cardboard, and even tyres for the last 30 years. Using ‘KerbCan’, cans from domestic kerbside collections or commercial premises are emptied into a hopper at the rear of the vehicle. From there they are carried on a conveyor belt with non-metal items automatically collected in an easily removable bin. The remaining cans are separated into steel and aluminum before each type is crushed into bales and placed in a storage area. The bales are then ready to be smelted down or sold on. The ARS system increases the capacity of each collection vehicle four-fold. 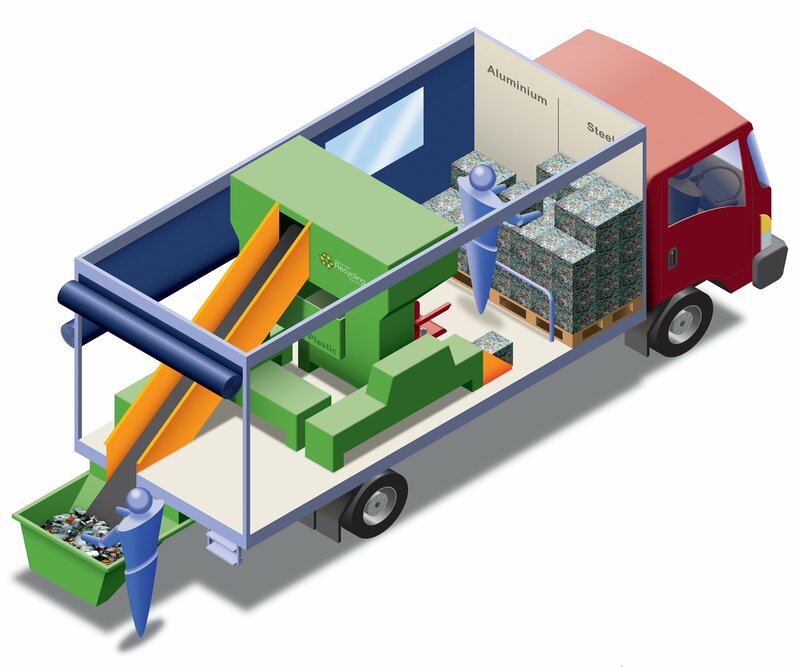 One person can operate the vehicle where collection points are some distance apart, or up to three people where the points are closer together and the flow of cans is more rapid. Waste energy produced by the vehicle when it is idling powers the system. KerbCan has been assembled from ARS’ existing range of modular recycling products. For more information visit ARS visit www.ars-chs.co.uk, or call 01209 611898.